Wrist and thumb pain can appear while lifting weights, or when doing such mundane activities as typing and carrying laundry. But no matter what you're doing, hand, wrist, and thumb pain isn't fun. But, you can use massage and rest to manage or cure the pain. This way, you can keep getting stronger or keep typing without pain. Both are important: let's solve them now! Your grip strength training frequency should be the same as any other muscle group. Work your forearms hard 2-3 days a week, as part of your normal workout. This means that for those days, you need to go hard. Get an intense hand gripper and weights that are hard for you to lift, and work. Hand exercise equipment that advertises, "You can use it Everyday!" won't give you the kind of strength you want. If a single chore gives you pain, try to break up the times you do it. Three hours of typing will have a much greater impact on your muscles than 3 different 1-hour blocks of typing, with rests in-between. And if a specific movement gives you pain, avoid it or substitute another kind of movement. It's simple, but if it hurts then don't do it. In either case, try these steps first. If wrist and thumb pain are really interfering with you, check with your doctor about it. Massage is important, since it's easy to over-stress your forearm muscles, especially when you're starting a new activity. Then you're in pain, and you need to knead, massage, and relax the muscles so you can lift at full strength again. 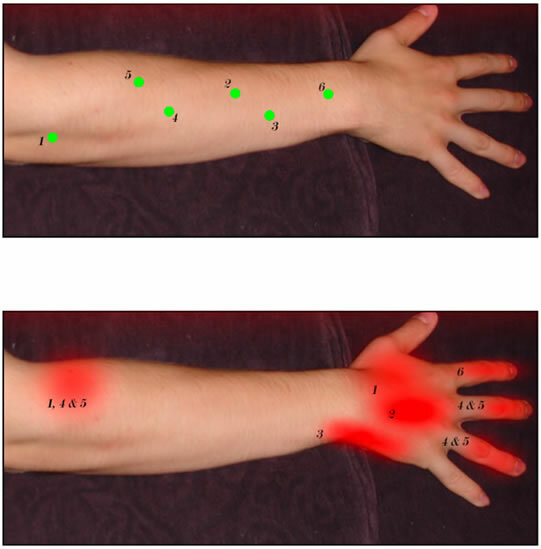 Anatomically, when your forearm muscles are over-stressed they form trigger points. These are little 'muscle knots' that are really painful. If you've ever had someone massage your shoulders and they found a particularly tight and painful spot, you know what I'm talking about. For your forearms, whenever you have wrist and thumb pain you should start at your elbow and start massaging all the muscles from there to those in the flesh of the palm of your hand. Take your time, and you will catch any and all of the muscles that are creating pain. Whenever you find a knot of tight and painful muscle, knead and massage it for 30-60 seconds and then move on. Multiple massages through-out the day are better than one intense, horribly painful, massage. And more fun. And try not to massage with your other hand! Use your body and lean against a wall corner, use your elbow, or lean against an irregular object. Using one hand to massage the other will just keep the cycle of severe wrist pain going. Here's a diagram showing the locations of the extensor muscles in your forearms and where they refer pain (ex: Muscle point 1 sends pain to the red locations labeled 1). Use this as a starting point for your massage, and then work all over your forearm. Catch every tight muscle! If you want more info I recommend The Trigger Point Therapy Workbook by Clair Davies. It has indexes of all your muscles and where they can send pain, as well as tips for getting them to relax. It's an awesome book if you have lots of aches & pains, and I personally use it all the time. Stretching will keep your finger joints limber & help relax the muscles causing your wrist and thumb pain. Flexible joints are healthy, and they work better than tight ones. You should stretch your hand foreword towards your forearm, back, and turn your hand to each side. The stretches, and their variety, will keep your wrists limber and ready for whatever you have to throw at them. That's how to go about banishing wrist and thumb pain, whether you're training grip strength, playing tennis, or doing swordsmanship. Wrist strengthening exercises, coupled with massage, stretching, and rest will give you strong and healthy wrists and forearms. So, get out there and try it! And remember, if you strengthen your whole body regularly in a smart manner, you can keep you body in good shape - and prevent that wrist and thumb pain from coming back. • Click HERE to leave 'Curing Wrist and Thumb Pain' & learn more about hand grip exercise!